"This fascinating and detailed book about acting is Miss Hagen's credo, the accumulated wisdom of her years spent in intimate communion with her art. It is at once the voicing of her exacting standards for herself and those she taught], and an explanation of the means to the end." "Hagen adds to the large corpus of titles on acting with vivid dicta drawn from experience, skill, and a sense of personal and professional worth. Her principal asset in this treatment is her truly significant imagination. Her 'object exercises' display a wealth of detail with which to stimulate the student preparing a scene for presentation." 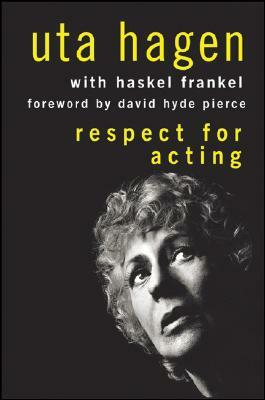 "Uta Hagen's Respect for Acting . . . is a relatively small book. But within it, Miss Hagen tells the young actor about as much as can be conveyed in print of his craft." "There are almost no American actors uninfluenced by Uta Hagen." "This is a textbook for aspiring actors, but working thespians can profit much by it. Anyone with just a casual interest in the theater should also enjoy its behind-the-scenes flavor." Uta Hagen was the recipient of innumerable honors and awards during her long career, including the prestigious National Medal of Arts in 2003. She died in 2004 at the age of 84. HASKEL FRANKEL was the drama critic of the National Observer.